He arrives at 9 a.m. with a water bottle in his hands and a blue t-shirt on his back. Forklifts whir and semi-trailers are backed into their docks as he clocks-in by a sign. “It’s been 351 days since a workplace accident,” it reads. Another day to extend the streak. 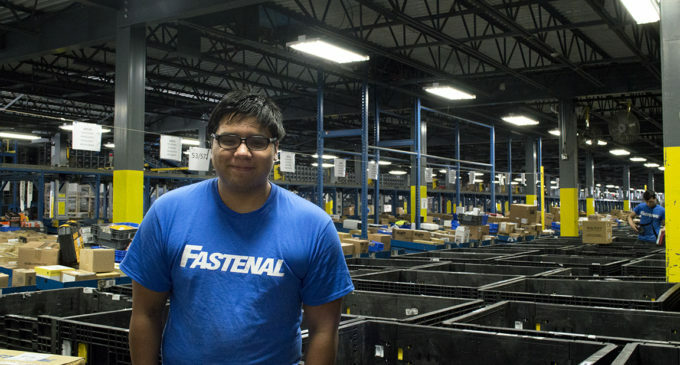 Finance junior Roger Tehuano, 19, a part-time picker at the Fastenal Distribution Center on Airport Road, arrives ready to work, just as many UNT students do. As a picker, Tehuano picks up construction material weighing up to 50 pounds and places them in their respective receptacles to prepare them for shipping. The Denton location is one of 14 distribution centers where Fastenal ships products, whether it be custom manufactured parts or standard commodities nationwide. This is his world of warehouse. The work can be physically demanding. Summers are sweltering. The warehouse gets hot, but Tehauno said the job is never too much for him. Tehauno worked at Jack in the Box before taking his job at Fastenal. But unlike many students, he didn’t pick up the job to pay off student loans. He did so to solely cover his food, gas, insurance and daily living expenses. He isn’t alone in juggling both school and his job at the warehouse. Makayla Dominguez, the administrative manager at Fastenal’s distribution center, said over 100 UNT students work at Fastenal part-time, making up the majority of their workforce in the warehouse. The incentives for working at Fastenal are flexible hours and a starting wage of $10 to $13 an hour. Fastenal is open 24 hours a day, six days a week. Whether it be working an overnight or a more traditional shift, there’s always work to do. Tehauno, who was told about the job by a fraternity brother, said he was excited to take the job despite the physical exertion. Don Cowell, regional quality manager at Fastenal, said UNT students are a great fit for their company. So much so that his son, biomedical engineering freshman LD Cowell, works there too. The exertion, Cowell said, is negligible compared to the benefits reaped from working at the warehouse. He believes UNT students are a good fit for the business. Cowell said one aspect Fastenal is currently working on is turnover rate reduction and retention of more employees. To do so, Fastenal has hired recruiters and has a large presence on job websites like Indeed and Monster. The company works for students at the school, as Cowell put it. Students are also able to pick up shifts during semester changes. But there were long days that became long nights for Tehauno, who had to work a number of overnight shifts. He’s worked the overnight shift beginning at 3 a.m. for a few months. But having previous experience at Jack in the Box vetted him well for the evening toil. One advantage to the graveyard shift was higher pay. This carried Tehauno through the tough hours. He still relies on financial aid and assistance from parents to pay for classes at UNT, something he appreciates. He’s even found light in the dark working overnight. One thing he takes heart in during the night shift is the lack of sweltering heat in the warehouse that takes place during the day. The common lack of sleep among those who work there make for a peaceful working environment. Beyond the world of warehouse, Tehauno sees himself working as a stock broker. He’d have more flexibility and a more secure work security that way. For now, he pays his bills with his body, lifting things up and setting them down for a living.